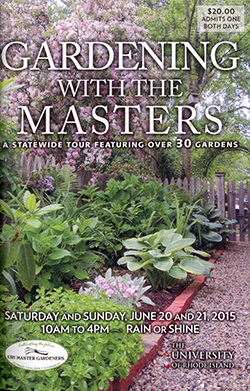 I am excited to be one of the gardens on the 2015 URI Master Gardener Garden Tour! If you live in Rhode Island, you are probably aware of the bi-yearly tour that includes gardens from all over the state. This year, the tour consists of thirty-four gardens. Some of them are public, designed and maintained by Master Gardeners, but most of them are the private gardens of URI Master Gardeners. This tour is such a wonderful opportunity to get inspiration, ask questions and see creative solutions to gardening problems! New this year, each garden has an educational focus which is related to the style or techniques used in the garden's creation. The educational focus of my garden is edible landscaping and my edible front yard. My traditional vegetable garden is also part of the tour and I think it is interesting to compare the two gardens. I'll also have some tips on growing food in small spaces. If you can't make the tour but are interested in my garden, I'll be posting lots of information here on my blog over the next couple of weeks. Ticket: Ticket is a guidebook which includes a map of garden locations by county, garden descriptions, educational focus and directions.Guidebooks can be purchased at nurseries and garden centers around the state. Go HERE for a list of locations. You can hear more on what I have to say on Edible Landscaping on this WADK radio podcast. This time I am the guest rather than the host! Also new to podcast is my show on Soil with my guest, Dr. Bob Rafka. Soil is such a fascinating subject and a better understanding can really help to make us better gardeners. If you are in the area, I hope you purchase a ticket for the tour and stop by to meet me and see my garden! Congratulations on having your garden selected for the tour!